Friday, July 4. American Independence Day. The first Friday of Ramadan 2014. Heavy security presence in and around Jerusalem. A delayed funeral for the 16 year old, Mohammad Abu Khdair. More rockets and mortar fire from Gaza into the south of Israel. Shattered lives. Crushed dreams. Hatred and fear in the air. There was a heavy police and military presence in East Jerusalem today, and this affected the transport arrangements as the Palestine of Jesus course followed its modified schedule for the day. Rather than travel to Bethany on the other side of Mt Olives, the group visited Yad Vashem, the Holocaust Museum here in Jerusalem. This is always a powerful site to visit, and I vividly recall my first visit during a Palestine of Jesus course in June 1990. The current context of fear and violence will no doubt have resonated deeply with the course members as they worked their way through the exhibits that showcase the evils of Anti-Semitism as well as the courage of those who resisted. For me it was a very different day as I prepared to leave my B&B in Kiryat Tivon and relocate to Nazareth for a night. In this part of the country life seems mostly untouched by the tensions in the south, and families were beginning their weekend with visits to the park and slow lunches in the restaurants. 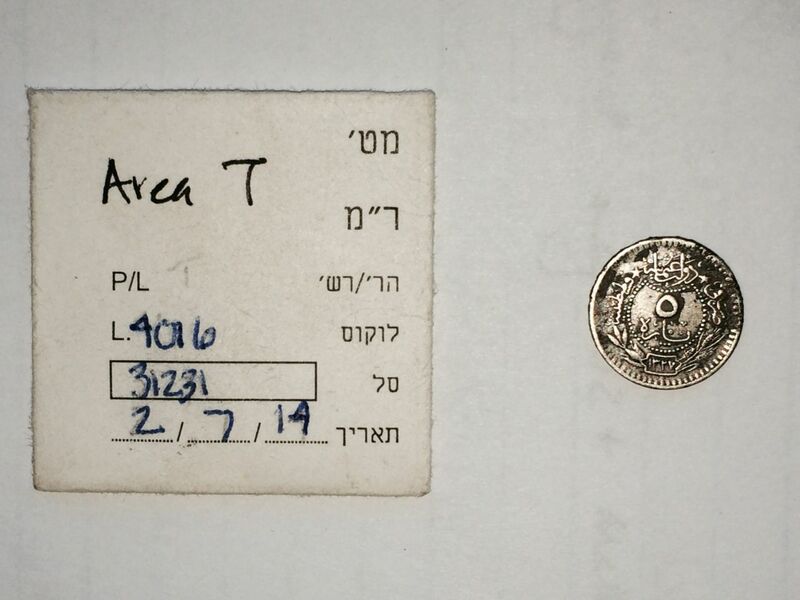 Around midday I met with Ariel Berman, one of the preeminent authorities in Israel on coins from the Islamic period. I like to meet with him each time I am here, and I especially look forward to working closely with him as my own research on Mamluk coins develops during the next 18 months. Today, in addition to a social call, I was carrying two Islamic coins from the dig where his expertise would be helpful as we tried to decipher their significance. One of them was this late Ottoman coin. It took Ariel just a few seconds to identify the coin and calculate the exact year of issue. This coin turned out to have been issued by Mehmed V (“Resad”), 1909–1918, and the 35th Ottoman Sultan. It was a 5 para coin, issued in his 5th regnal year (1327+5 = 1332 AH = 1913 CE). This was a year before WW1 erupted, 100 years ago this past week, and turned the world upside down for many people—including “Resad”, the conqueror! The other coin was also Ottoman, but from 1790. Minted in Egypt, it had been used as an ornament long after its issue by Selim III. I took careful note of the key reference works used by Ariel, and have already ordered the book that provides a ready index to the Muslim and Christian calendars. This saves a lot of time that otherwise needs to be spent to calculate the correlations. By mid-afternoon I was settled into my hotel in Nazareth. Casa de Maria was my home for two weeks back in 2012, so I was welcomed back like the prodigal son—and given the best room in the house. It will be good to spend some time with the family tomorrow morning, before I head down to Tabgha to meet up with the Palestine of Jesus course that will be arriving tomorrow for three days in the Galilee. As the sun was setting, I met up with two of my closest Nazareth friends for a lovely evening meal in the new Tishreen restaurant on the ridge between Nazrat Illit and Nazareth. The outdoor deck provided a lovely view of Nazareth as the daylight faded. This entry was posted in Archaeology, Bethsaida, Coins and tagged Nazareth. Bookmark the permalink.